In recent years, economic difficulties, increasing pauperization, and migration of the middle classes have caused changes in the social structure of some of Berlin's districts, often worsened by ethnic problems. Therefore, in 1999, the government of Berlin, in close co-operation with the concerned boroughs, has defined areas with special development needs'. In order to achieve a lasting improvement of the situation in those areas and to contribute to their stabilization, it was decided to implement a 'Neighborhood Management' (NM) in each area. This was done within the framework of the program 'Districts with Special Development Needs - The Socially Integrative City' initiated by the national government and the governments of the federal states of Germany in 1999. Initially, the pilot scheme was intended to run for three years. In these 17 neighborhoods, about 227,000 people lived altogether. The number of residents in each neighborhood ranges between about 4,500 and 24,000 people. 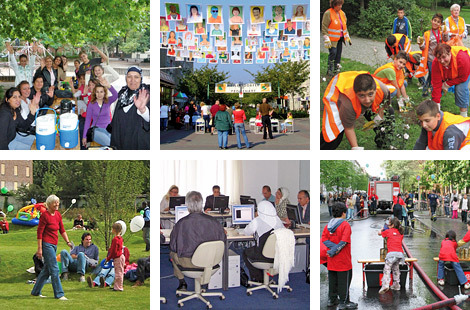 In 2011 there were 34 areas in Berlin with an active 'Neighborhood Management'. 390,000 people live here altogether. In 2015, one area has been released successfully. In 2016, 4 new 'Neighborhood Management' have been started and by the end of the year 2016, a further 3 areas 'Neighborhood Management' will be completed and released.